The Admin Open command allows the user to open a file as an Administrator, thereby having access to security options. A password is required to log in as an Administrator. The Admin Open command displays a Password dialog, requiring the user to enter a password in order to open a file. Once a valid password is entered, the Open dialog is displayed, allowing the Administrator to select a file to open. A specific file may be opened by selecting the filename in the Open dialog and clicking the Open button. Once a file is opened by an Administrator, security restrictions for that file may be set using the File Security command on the File menu. To set security restrictions, the user must open a file as an Administrator via the Admin Open command in the File menu, and must supply a password. Administrators are not subject to any security restrictions aside from the password required to open a file as an Administrator. Therefore, when setting security restrictions, the restrictions will not be seen in the spreadsheet until the application is closed and reopened as a User. Security restrictions are saved with the file. The Administrator must save the file prior to exiting E-DataAid, or the restrictions will be lost. Since the restrictions are saved with the file, the restrictions will apply on any machine to which the file is moved. Administrator passwords are not saved with the file, but are machine dependent. Different passwords may be used on different machines. Opening a file as an Administrator (i.e., via the Admin Open command in the File menu) requires the user to enter a password. Passwords are case insensitive and must be a string containing 4 to 8 alphanumeric characters. An encrypted version of the password is stored in the computer’s registry, and is therefore machine dependent (i.e., use different Administrator passwords on different machines). Different passwords may be used to open files as an Administrator on different machines, but the same password will allow any data file to be opened as an administrator on a single machine. The first time a user opens a file in E-DataAid as an Administrator, the default password is set to “admin.” After the first login, the password may be changed via the Change Password command under the File menu. The application allows three attempts to enter a valid password. The Change Password command displays a dialog allowing the password necessary to open a file as an Administrator to be changed. 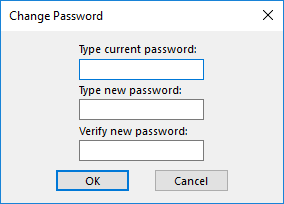 In order to change the password, the old password must be entered once, and the new password must be entered twice (i.e., to verify the new password value). Password changes take effect immediately, when the Change Password dialog is dismissed with the OK button. Choosing Cancel dismisses the dialog without changing the password. Passwords are machine dependent, and are not saved with the data file (i.e., it is possible to have different passwords to open files as an Administrator on different machines, but the same password will allow opening any data file as an administrator on the same machine). The Change Password command is active at all times. This will allow an Administrator to change the password without having to open a file.